Added on 04 September 2018 . By Georgia Evans. 1920's-inspired restaurant, Mugshot is the newest addition to Bristol's thriving food scene. Giving diners an experience packed with Instagram-worthy photo opportunities, the restaurant offers 'mugshots' on entry, sizzling hotplates and wood-fired pizzas to tuck into while nestled in plush decor. Upon entry, each guest is invited to have a Polaroid mugshot taken before ordering their meal. Specialising in delicious cuts from the local butcher, Ruby and White on Whiteladies Road, Mugshot includes triple-cooked chips, two butters and a sauce of choice in the price. 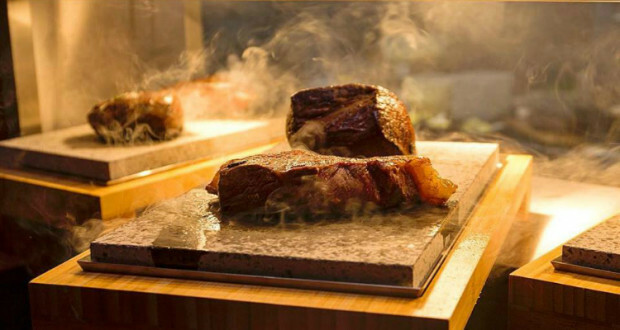 Each steak is then served on a sizzling hot stone, allowing diners to cook to their liking. For larger groups, sharer plates are available with options such as a 600 gram Porterhouse and 750 gram lamb cutlets to feast upon. There are also wood-fired pizzas available with dipping sauces, as well as vegan and vegetarian options. The drinks menu offers a carefully curated selection of cocktails, beers and wines.